← running barefoot in central park. We are definitely not the first ones to discover this place as the New York Times already spotlighted them on August 22, 2011 but my husband, BBQ lover extraordinaire got us out there before then. He can sniff out a BBQ restaurant putting down roots from a mile away. I wasn’t so sure about it. It’s located across from a playground called “Dutch Kills,” what’s that about? What the exterior lacked the interior provided. 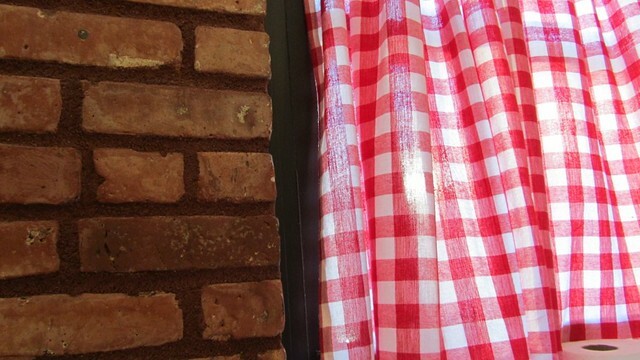 A wall-sized chalkboard with the menu printed on it, a tall counter hiding the delicious meats, perfect red and white picnic table style curtains and table cloths against one brick wall and opposite a brown painted wall with the “Come and take it” banner that every good Texan is so familiar with. The place had steady traffic on our first visit but there were still plenty of empty seats but it was a different story on our second visit where the door never stopped swinging and the seats were full. This tray is of our first visit last week. We didn’t realize we were missing texas toast style sliced bread (which according to everyone else’s plates and our 2nd visit were a standard accent to any order). We were happy with what was on the tray. My husband practically drooled over the burnt ends and the guy behind the counter was really great about taking the time to explain what BBQ is to the locals. I noticed he especially had to explain the burnt ends to every single person that walked in the door. We are Texans though and my husband is half BBQ, so, you know, no explanations necessary here. 1st visit. ribs. burnt ends. brisket. fries. John Brown Smokehouse. On our second visit, this week, we were happy to see that there was a revolving door of people both filling the tables and ordering food to go alike. Word of mouth and the NY Times must have made a difference. I know we told several people after our first visit and will continue to do so. We went in specifically for the burnt ends and my husband’s heart sank when the new-to-us counter person said they were out. After we sat down though we overheard a different counter person tell a guest they had some so, believe me he hopped up and adjusted our order accordingly! the staff was amazing. on our first visit there was one uber-friendly woman working the counter and one guy slicing the meats in addition to the kitchen crew. On our second visit there were way more people behind the counter/kitchen and in the dining room. They weren’t always on the same page about what was available and what wasn’t but they smiled and answered everyone’s questions to a fault. The guy slicing the meat got the brunt of the questions and he was more than willing to answer them all. pulled pork – never been a fan but this was so delicious, very tender and it didn’t get stuck in my teeth. 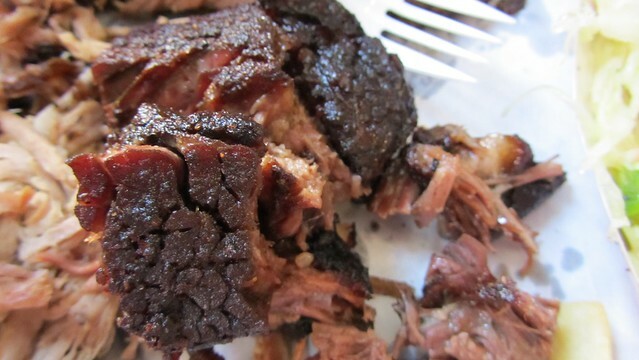 burnt ends – my husband referred to them as “meat candy” and he’s right. wow, this was juicy, tender, flavorful, crunchy, and both sweet and savory. 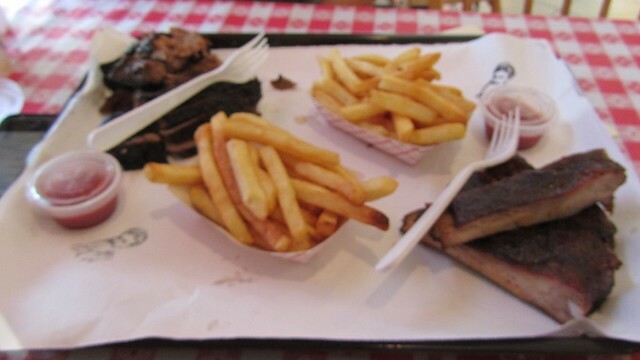 brisket – not my favorite, fattier than I like but nice thick cut and tasty. I usually ask for a lean cut at BBQ places but not this time. pork ribs – delicious and juicy, just spicy enough and very nice dry rub. 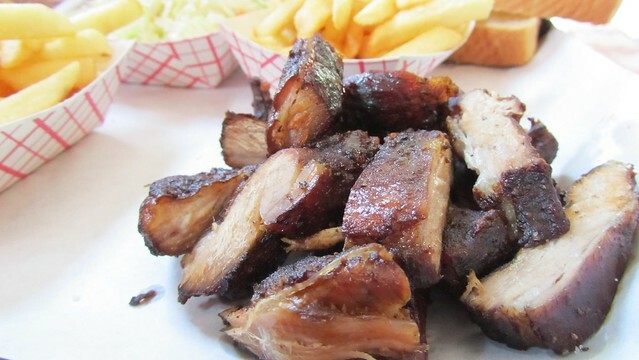 rib tips – not a fan. I only ordered them ’cause they were out of pork ribs (a good problem to have) and they were dry. photo evidence included. fries – pretty conventional but tasty. 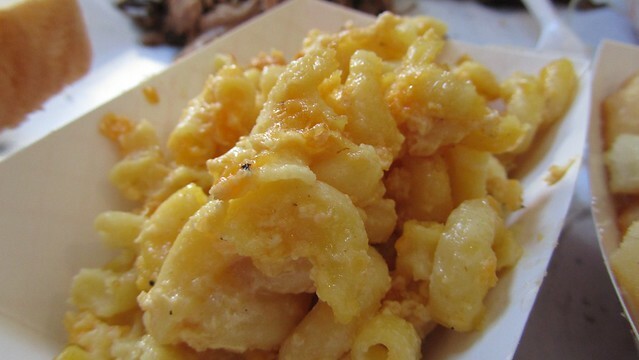 mac and cheese – tasty (way better than Neeleys Barbecue Parlor, but not Hill Country BBQ amazing). 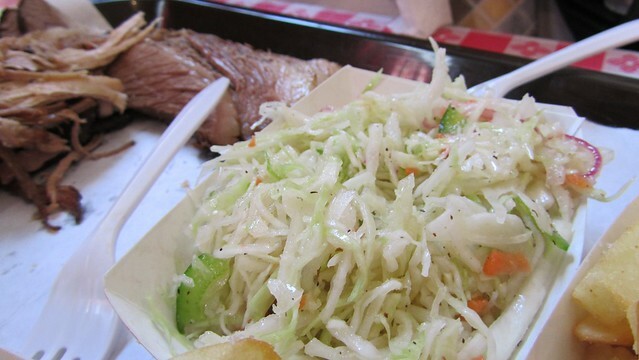 cole slaw – not usually my first choice on a menu but this was so good I think I ate most of my husband’s portion. I would eat a bowl of this crunchy, cool, spicy concoction. BBQ sauce – wow. thick. deep brick-red in color with an amazing spicy kick that perfectly accentuates the meat and doesn’t just pour through the thick-cut slices of bread. burnt ends. John Brown Smokehouse. mac and cheese. John Brown Smokehouse. good but not amazing. cole slaw. John Brown Smokehouse. rib tips. John Brown Smokehouse. On our 2nd visit they were out of ribs so I settled for rib tips but I think you can even tell from this photo that they were pretty dry. mac and cheese. pulled pork. John Brown Smokehouse. 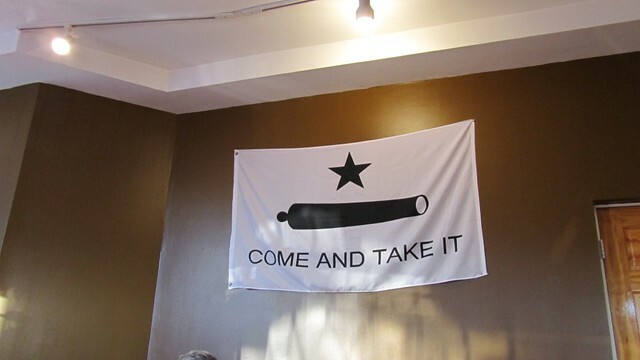 come and take it. John Brown Smokehouse. we took it. you should too. I just submitted this post to the Astoria Blog Carnival. Check it out for more awesome Astoria eats! I'm a girl from Texas living in New York since October 2010. I fell in love with New York City on a business trip here in April 2009. I had to drag my husband along for the ride at first but just a few hours on his own while I was at the conference and he was completely on board. He began texting me mundane things like the price of milk and the quality of produce so that I could see it wasn't so much different than Austin. What are the chances that after just one week in New York two people would leave with the exact same resolution to one day live there? We did. Just about 18 months later we signed a lease on a new apartment and started a new chapter in our lives. This blog will hopefully give me a chance to document our adventures in New York as well as to share my perspective on the same using photos and stories. enjoy. This entry was posted in everything i've blogged, food, locations and tagged Astoria, BBQ, dining out, New York Times, Queens. Bookmark the permalink. 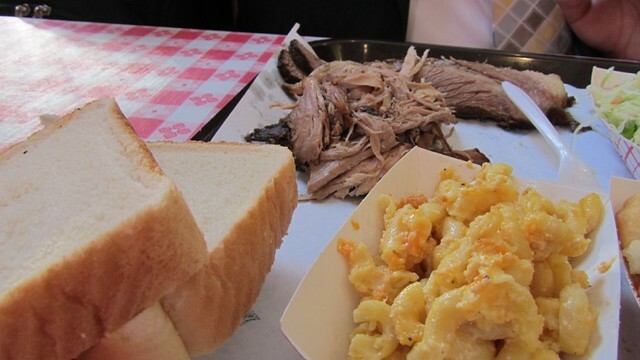 3 Responses to John Brown Smokehouse. wow. I’ve been wanting to try this place since beginning of August, as it sounds amazing. 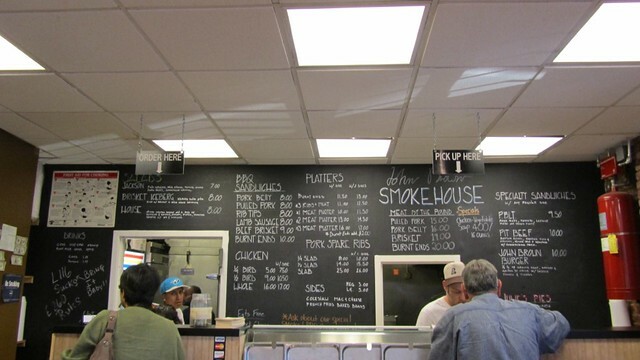 I’m actually a big fan of pulled pork, so I’ll likely get that and the yummy burnt ends. Thanks for explaining their offerings – I can’t wait to try it! Glad I could help Meg & thanks for stopping by! I’m sure there’ll be more food posts to come :) This place feels like a real coup for the neighborhood, we should all patronize them so they can grow strong roots here.